1. In a medium saucepan, add the milk and the vanilla pod. Bring the milk to a boil, stirring occasionally and then remove from heat. Meanwhile, in a small bowl, use a fork to stir together the cinnamon and cocoa powder - set aside. 2. Add the chopped white chocolate and stir with a wire whisk until melted and combined. Whisk in the brandy and vanilla extract. 3. Use a fork or a pair of tongs to remove the vanilla pod and throw it away. 4. Return the white chocolate milk mixture to the burner on low heat and whisk vigorously just to give it a tiny zap of heat, but do not let it boil. 5. Pour a shot of espresso into each coffee mug or hot chocolate drinking glass and then pour the milk mixture over the coffee. 6. 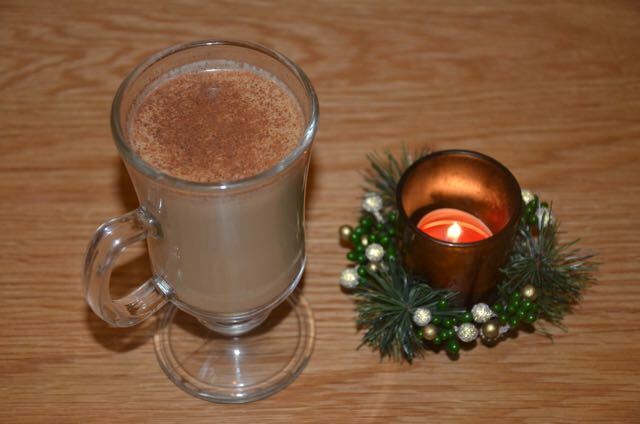 Use a small mesh strainer, a shaker or your fingers to sprinkle the cocoa and cinnamon mixture over the coffee. Serve hot.